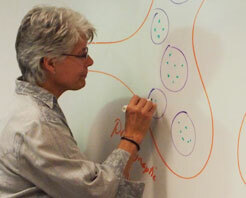 “Mind and Matter”—is it a cell biology class or a creative writing workshop? Students place their feet flat on the floor, and are reminded to “Clear your head, clear your heart,” then listen to a poem. When everyone is focused, the discussion launches into—neurobiology. Then, with greater understanding of the cell, students explore, through their creative writing, how we understand ourselves as fragments and as a whole. How does the electrical signaling of neurons work and how do neurons interpret what comes from the outside work through our eyes and skin to the central nervous system and on to our brains? The course “Mind and Matter” is cross-listed in creative writing and biology, and is team taught by neurobiologist Lin Aanonsen, the O.T. Walter Professor of Biology, and Ping Wang, creative writing professor and author of the award-winning Aching for Beauty: Footbinding in China and other works. The course came about when Wang brought her creative writing class on pain and healing to Aanonsen’s neurobiology lab, where her students solemnly held a human brain, source of the experience of pain. “There was this amazing synergy and sense of wonder that came out of that,” says Aanonsen, and within moments the two faculty members were talking about team teaching. The course consists of three units in biology: Cells of the Nervous System; Senses—Touch and Pain; and Memory and Emotion. Each unit is intermingled with literature and creative writing related to the self and other, the five senses, and memories, requiring students to think about mind and body, spiritual and material, science and art. In addition to classroom time, the group gathered in Aanonsen’s neurobiology lab. For students who found the biology material heavy going, Aanonsen held “office hours” in the campus center, allowing students to drop by for casual help with still-fuzzy concepts. To help connect mind and body, a group meditation session was led by chaplain and Zen practitioner K.P. Hong and Wang’s Tibetan lama friend Yeshi. 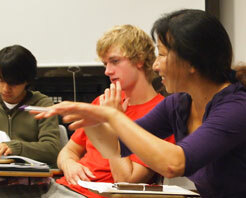 In addition to regular work shopping of students’ writing in class, Wang and teaching assistant Ryan Dzelzkalns ’10 met individually with students to discuss their writing.